circle of ironies all caught in this moment, a window into my incredible circle of life. I love boating. I love yachting. I’ve taken both my Sea Ray SunDancers (23′ and 40′) to NYC from Long Island, several times over the years. Motorboating around Manhattan, especially at sunset, when the sun reflects on Manhattan’s stunning skyline, is best seen from the New Jersey side. Nothing more spectacular than to see My Boat, Bay, Sun and the NY Boat Basin. 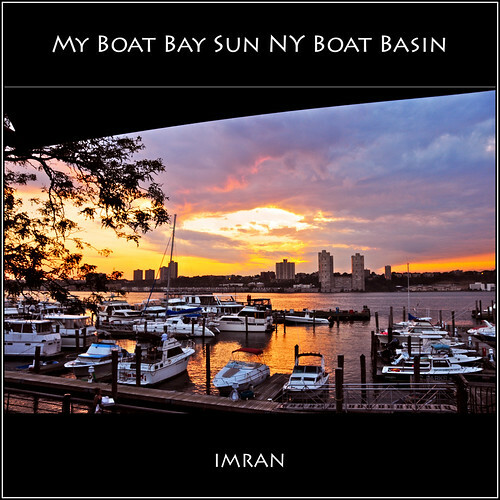 My Boat, Bay, Sun, NY Boat Basin – IMRAN™, originally uploaded by ImranAnwar. Thank you all. My 25th Explore! September 16, 2010. Well, technically speaking, this is not a Bay. But, the width of the Hudon River, between Manhattan, NY and New Jersey, is wider than some Bays I have boated in. The NY Boat Basin at 79th Street, is a delightful and unexepected vision in one of the world’s busiest cities. Joggers and bikers zip by you as you walk along the waterfront. The marina has a few decent sized boats, but not the mega-yachts you would expect to see line the slips. The area is not far from where the Miracle On The Hudson flight crash-landed safely in the river. This image of the setting sun, reflecting on the water, tinging everything with liquid Gold light, was captured near the end of Summer 2010. The arch of the structure I took this photo from (where I also photograpged the dazzling Daisy) makes a delightful curved silhouette almost as if it was done by a computer. The Statute of Liberty, in New York, is one of the best recognized symbols in the world. Less known are the full words of the poem found there. See it larger. On a heavily clouded day in Manhattan, the often blue sky filled with shades of gray was burdened with the weight of a golden red sunset they were trying to conceal. The light was the worst it could be for a great traditional photograph. 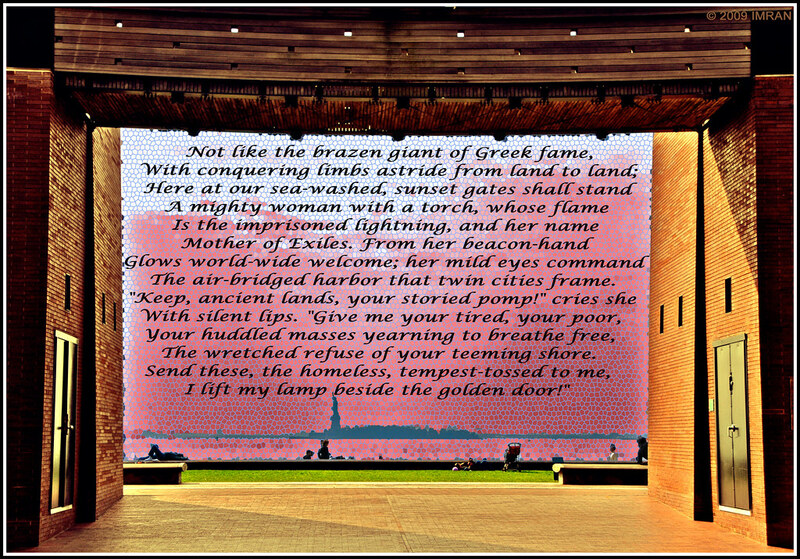 But, as I caught the patina of Lady Liberty through the architectural frame painted Gold by the falling sun….. it provided the perfect backdrop for me to remember, and share, the words that hold so true today, and forever. I wrote the following words on December20, 2008 to celebrate nearly four decades of photography and to salute my father for setting me on this hobby, and many other great paths. I am sure readers will recognize some of the items and gadgets I mention in this trip down photographic memory lane; no pun intended. My Father gave me a camera when I was 6 years old. It was a small 35mm film camera, made in Japan. It was a time when cameras were expensive, and processing film even more so. At that time I had to start with simple black and white films. I had to use pocket money in Karachito develop photos taken with that camera as I grew up in Karachi, and attended St. Paul’s English High School in Saddar. In four decades I sure have come a long way. From that startup Japanese camera to today’s amazing Nikon D300 DSLR that I received on my 46th birthday, a lot has happened. Forty years of life, 40 years of photography, a lifetime of memories. I hope to see and capture a lot more, God willing, and to share with my family and friends the many unforgettable sights I have seen. So, as I said, I started with a nice little Japanese camera my dad gave me as a kid going to Karachi. He also had the confidence in me to let me use his more expensive and also more breakable camera, a really reliable Argus (that still works!). From his passion for photography and traveling to new places with us, he and I captured our memories and our lives as I grew up in Pakistan. After my O’ Levels exams I moved to Aitchison College, in Lahore. By then I “borrowed” (ahemmm…. somewhat permanently!) the camera Abu had started using. It was a truly awesome (for it’s time) Yashica Electro35 camera. I then found myself studying (well, that is a liberal use of the word!) for an Electrical Engineering (Electronics) degree. Unfortunately, some of my work from the late 1970s to mid-1980s is lost forever, turned to ashes when USA and Reagan–Bush Sr. backed Taliban type right-wing fundamentalists ransacked and burnt my stuff in my hostel room at Lahore’s University of Engineering & Technology. (Ironic how similar people are now called terrorists, back then they were “mujahideen” supporters of Zia and the US policy of promoting Islamic fundamentalism against the Soviet Union). The Yashica Electro 35 was stolen and not recovered. Even terror(ist)s know how to use a camera. The typewriter I used to get published in the then popular newspaper The Pakistan Times was also stolen but later returned. Terrorist supporters, even the jeans-wearing ones in Mumtaz Hall who hung out with the hot babes of UET didn’t need no stinkin’ typewriter. Why use words when you can use guns, I guess? Anyway, even before I finished my engineering studies, I was invited to, and was thrilled to join the owners of Jang Group‘s (especially the brilliant owner and publisher of MAG Weekly as well as Jang and News, Mir Shakil-ur-Rehman) team in Lahore. Even though I came on to write a youth page, within a few days I was privileged to become Business Manager, and also started writing weekly articles in MAG Weekly in Karachi. I would rush them to my then colleague, later friend, and now a fond memory, the late Wahab Siddiqui who was Editor of MAG. Since I drove around in Lahore a lot, I also started carrying a portable camera in my car and took ‘slice of life’ photos called PIC(K) OF THE WEEK with a caption that made people think about the ironies, absurdities and tragedies of life we see everyday and just drive on by. But, life has it’s own plans. After a few years of working at Jang, I picked and packed my proverbial bags and came to America; exactly 20 years ago (January 1989 to be precise). I was fortunate to come to America on a scholarship to get an MBA at Columbia University in New York City. My parents came to visit me a few months later (Abu had to go for some higher studies on a fellowship of some sort). When he went off for studies (somewhere in Utah I believe) my mother and I went around town (Manhattan) from my Columbia University apartment. Our favorite visit together was to the top of the World Trade Center in New York. It was one of the best times of my life spent with my mother, whom I lost just 2 years after her return to Pakistan at around age 50. 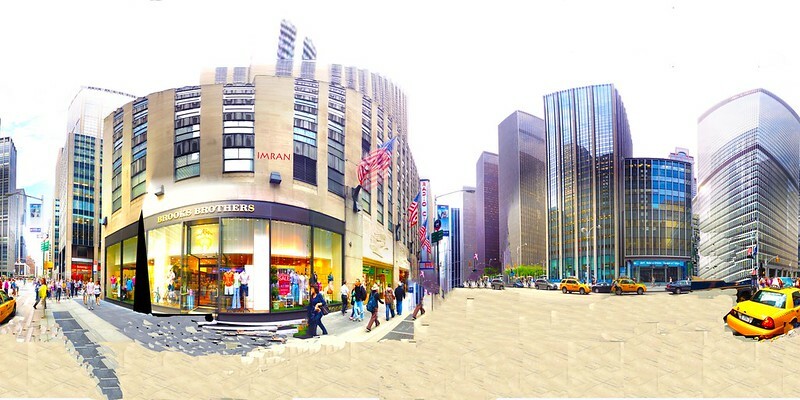 When we were in New York, my then current model camera stopped working so I was saving up for the camera I badly wanted. She wanted to buy it for me but my dream camera at that time, the MinoltaMaxxum 7000i, was too expensive for me to let her buy for me in 1989. Maybe I should have – as I could have captured many more memories of my parents’ only trip to America together. I did buy it a few years later and took some stunning pictures – of beautiful places, gorgeous faces – during my Manhattan years. I loved taking these photos especially when I was living a blessed life at The Monterey (on the Upper East Side of Manhattan overlooking one of North America’s largest and very beautiful mosques) and when visiting loved ones in Washington, DC and friends in California. Life, time, lifetime friendships, captured in memories in the heart and on film. In last week’s article I mentioned how I came into photography, thanks to my father inspiring me in every way a father can inspire his son. He loved photography, and got me a camera at age 6. I mentioned how I progressed from a small, simple 35mm camera in the late 1960’sto one of my favorite film cameras in the late 1980’s. The 1990’s brought along a new revolution. Along with the 35mm film Minolta Maxxum 7000i, I became one of the earliest users of digital cameras when the first Apple QuickTakedigital camera came out. 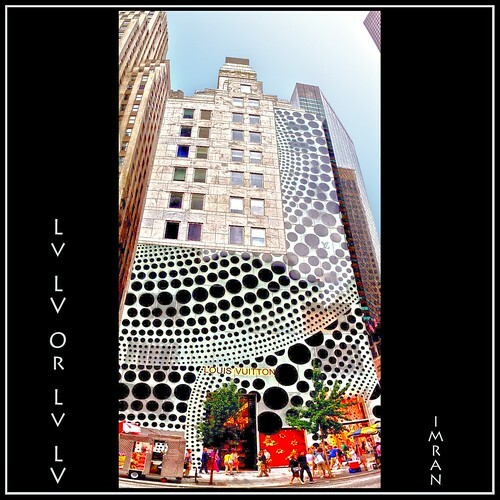 I even have some of its pictures on my web site, at IMRAN.COM . I later upgraded to the next Apple model and I still have it as a memento. It seems so ancient now! It’s part of my Apple collection of Mac IIfx, ColorOne scanner, StyleWriter and LaserWriter printing equipment that still reminds me of my love affair with Apple and its technologies. Maybe I will give it to a museum some day (if I don’t end up having to sell everything to survive this economic downturn, that is!!). Not much later 2 Megapixel cameras were coming out so I invested in, and loved, a Minolta DimageX 2MP. My flickr photo-sharing page ( flickr.com/imrananwar) has some taken with that camera. That camera was unfortunately lost but it was impressive both technologically (a marvel in how it “double-turned” light rays to provide an actual optical zoom lens without having a lens protrude from the camera body!) and color quality. During the next few years I got the 5MP NikonCoolpix E5700, which took some of the amazing Palm Beach and Singer Island, Florida, photos you see on my flickr pages. You should take a look, too. Some of these have been enjoyed by more than three thousand people! I still use it with an amazing panorama EyeSee 360 lens. (Ooops, typed too soon, that beautiful camera and specialized lens were shattered a shortly after my writing these lines, when the Nikon strap slipped out of the hook, sending the camera and the lens sliding to hit the road and smash into little pieces! Note to readers, never assume that cameras and other things connected by straps will not slide off. Always check the straps regularly). Hundreds of panoramic images of Europe, United States and other places are still to be processed and put online. I hope to do soon, so my family and friends can view them and feel like they were right there in the room or city or museum right beside me. It helps me bring the joy of going to the most remote places in the world and knowing I can share the experience with my father, and my loving family and friends. For portability, and to get back to taking “slice of life” photographs as I used to take in Pakistan for MAG Weekly, I had also added another Nikon to the mix. I replaced the lost Minolta Dimage X with a Nikon S6 (slightly larger than the S1/S5 but WiFi built-in for ease of transferring to the Apple MacBook Pro laptop). But for real SLR photography with changeable lenses I was in a quandary. I did not know whether to move from Minolta (my Maxxum 7000i film and Dimage X digital) to another Minolta, their newest DSLR, or complete the migration to Nikon by adding another Nikon like the D60, to accompany the E5700. (As my photographer readers will know, it is not as simple as just picking up a Sony or Panasonic DVD player. Selecting cameras is almost as much a matter of taste and preference as wanting to be a Mac user). Anyway, on the photography front, though I did not get the Sony Alpha DSLR, nor did I move to the Nikon DSLR ship right away. I found the Nikon D40 and D60 not enough of an advance to make the jump. And, then, on my return from my recent trip to visit my father, I finally did. I had decided on the Nikon DSLR D30012.3 MP camera when it came out and I got it as one of the best birthday gifts I have ever received from a loved one. I invested in some additional lenses and flash, etc. and I love it. Sheer magic and take a look at flickr.com/imrananwar. That page has just some of the photos to prove the magic. Some have already won awards, been used in calendars and traveling road shows by companies here and 2 will be used as “INSPIRATION” posters by another company. Check them out and leave comments. I hope to be back in Pakistan soon and put it to use on photos of my family and beloved homeland of Pakistan. I have also selected some photographs to make a printed coffee table book for my father to see and show his friends the amazing magic I was able to capture from a gift he gave his son 40 years ago. My 40 years journey in photography so far. It was started by my father’s gift of a camera. It developed from my mother’s gift of telling us never to miss any moment of the beauty in the world around us – before it is too late. I try to do that, every day, in my own way, by living and capturing that incredible journey, for myself, and, I hope, online, for you and others. The photographs of that journey are online and on my computers, now and in my mind for as long as I live. Forever? I hope so. The Internet and my “Live, Forever” project (at neternity.org ) give us a chance to leave coming generations a permanent record of our having seen the amazing world I saw, we saw, with our eyes. I hope our visions are seen, for an Eternity, if you do the same. I emailed the first draft of this tribute and article to my father by email. He had just arrived back in Lahore from a trip. I spoke to him late on the afternoon of December 20, 2008, and had a wonderful conversation with him on the phone. A few hours after my salute, Mr. Anwar-ud-Din, beloved father to my siblings and me, passed away from unexpected cardiac arrest early on December 21, 2008. ILWIR. His smile, his love, his words, his sacrifices for us, his very presence in the lives of all that he touched – they are all etched in our hearts and memories for far longer than an eternity, far deeper than any photograph can capture. May Allah bless him and my mother with a great place close to Him in Heaven. I thank you, dear reader, for saying a prayer for my parents, and all the great people who have left us and now live forever in our memories. I thank you from the bottom of my heart.